I often see recipes posted on the internet that include no mention of how the beer turned out, and in the rare case that they do mention what the beer tastes like it is brief and vague. I hope to post reviews and results for all the recipes I talk about on the site, in fact I'd like to do updates as time goes on to show how age can effect the beers I make. 48 days ago I brewed this beer, and it's now been in the bottle for 2 weeks. I went with one of the bottles that was spiked with dry US-56. Appearance – I had left the bottle in the fridge for 24 hours before opening, even with 15 minutes to warm up before pouring it still had plenty of chill haze. The head is initially vigorous, creamy and stark white. However, it sinks pretty quickly leaving just a thin spotty covering. As the beer warms it gradually begins to clear, but never gets crystal. Smell – Opens up with lots of lemons, and a mild herbal/grassy/spicy hop aroma. There is a light earthy-funkiness hiding behind, but it certainly is not a primary aroma. Overall pretty clean, but there is enough going on to let you know this is not a run of the standard style. Taste – Lightly tart, with bready malt. Plenty of esters, apples and pears for the most part. There are some barnyard notes as I get closer to the bottom of the glass. It's pretty well balanced, the hops are not assertive, but they certainly are stronger than in most traditional “wild” beers. Mouthfeel – Prickly carbonation with a medium body. Feels surprisingly full for a beer that finished at 1.009. Drinkability & Notes – Certainly still tastes young, but damn tasty for a Brett beer that only has two weeks in the bottle. I'm looking forward to seeing how this develops over the coming months. I know what you mean about not having a followup on how brews come out. I'm probably guilty of it as well on my blog. I'd venture to say that it is difficult to convey an accurate description of taste in words and pictures, which is what we can work with on the web. I like how you've broken down your description into sections, is there any recognized standard way of doing this? I'm very interested in a better way both to communicate and to assess flavor. Hey, I ended up here via BeerAdvocate, nice site you have here! Tasty looking beer as well. Thanks for the comments guys, and thanks for the blog links now I have something to read while I’m bored at work. I like breaking my ratings down because doing so makes it easier for me to read plus it keeps me on track while multitasking drinking and writing. I find that even if the words I use are only decipherable by me at least I’ll have an impression of how my beer changes from month to month. If anyone else picks up what I am trying to get at, all the better. Even if I don’t always write down my ratings that often anymore I’m still going through the categories in my head while I drink. 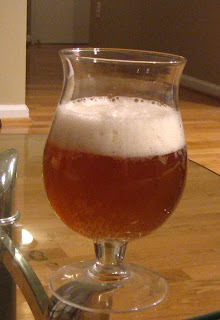 hey, - Deffinitly put those bottles down for a while, but watch out for over carbonation. I have a year old 100% brett beer that's great right now. I like at least 6 months for my brett beers/ or brett spiked beers. Thanks for the comment, I'm really looking forward to watching this one mature over the coming months. Ha ha, that is pretty funny about the coriander comment. So Mike, how is the Mo' Betta progressing now that it's been in the bottle for while? Specifically, have you seen a large increase in carbonation or experienced any gushing? Did you wait for a period of time at a stable gravity before bottling? Thanks. I may just give this one a try as well, once I've bottled my Orval. Carbonation is holding pretty steady on both my Brett beers. The gravity really didn't change on them after about 2 weeks. Not sure if the Brett just takes awhile to go into super-attenuation mode, like a last ditch survival thing or something. I'm trying not to drink much of either so I have enough for samples over an extended aging period.